The following are detailed specifications about the Eggshell Silk Drum Lamp Shade with Deep Spider Assembly. This lamp shade, wrapped in an eggshell silk fabric, will be an elegant addition to your home. The fabric is of the finest premium quality that will not get frail from smoke or sunlight and will last for years. It features a very clean aesthetic that is perfect for adding a fine accent to your decor and for a huge range of light fixtures. With sleek piping, this shade uses powder coating and comes with a spider fitter that fits most traditional harps. It measures as 18-inch slant, 16-inch top width, and 18-inch bottom width. 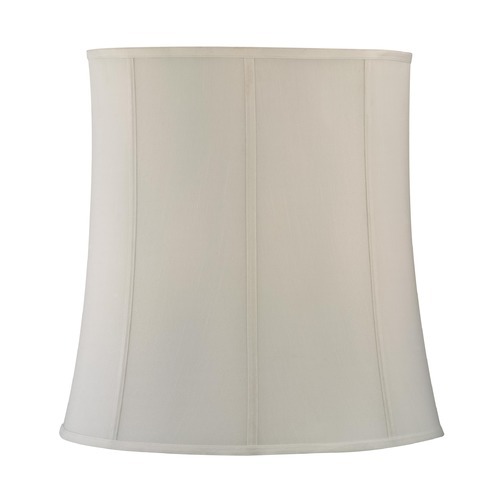 This Eggshell Silk Drum Lamp Shade with Deep Spider Assembly is part of the $item.xCollectionName Collection from Design Classics Lighting. The following items are also part of the $item.xCollectionName Collection.